Back in 2009, Bit Trip Beat was released for the Nintendo Wii through its WiiWare service (and later mobile devices and the 3DS). The game featured graphics reminiscent of the Atari 2600 and was a rhythm game where you controlled a paddle on the side of the screen that resembled Pong to hit incoming blocks in rhythm to the music. This was followed up with Bit Trip Core in which you fired lasers out of a cross in the center of the screen to hit incoming blocks, once again in time to music. 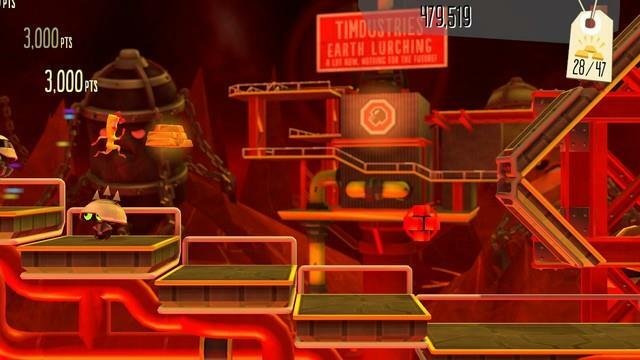 Overall, the Bit Trip series is comprised of seven games in the past few years, and today I’m going to take a look at the latest in the series: Bit Trip Presents…Runner 2: Future Legend of Rhythm Alien. 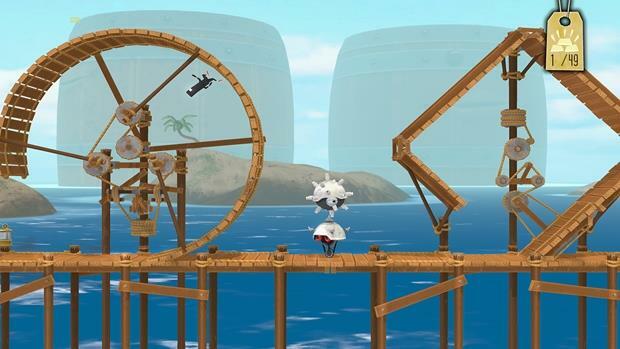 While I’ve never played the original Bit Trip Runner, I have seen videos on various sites and from what I can tell, Runner 2 plays pretty much the same way. The goal is to traverse each auto-scrolling stage while collecting every bit of gold you can as well as four red crosses. These go towards your final score for the stage, and collecting everything gives you a perfect bonus and lets you shoot yourself out of a canon at a giant target…yes, you read that right. You get to shoot yourself out of a canon. I’ve got to say that the first time I saw that I kind of laughed out loud a bit. Now of course if the whole game was just running around and collecting things, it wouldn’t be too interesting of a game now would it? 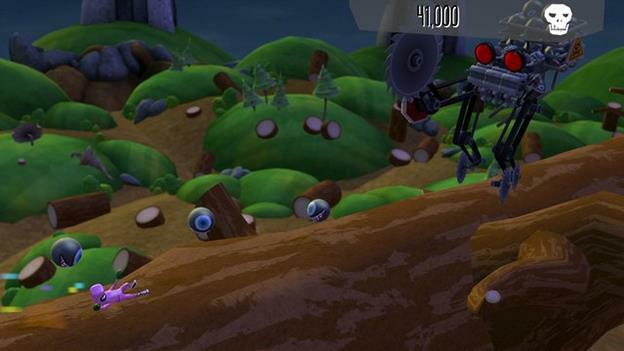 Throughout each stage you have various enemies and obstacles to dodge in one of a few ways. 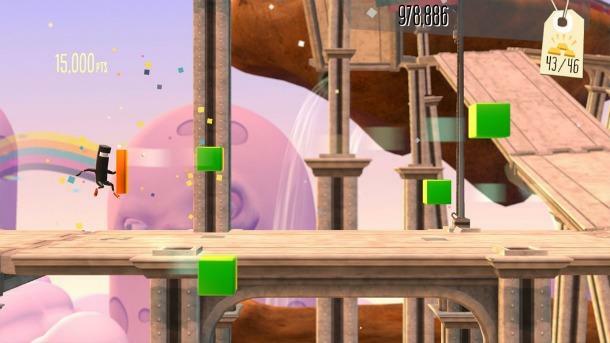 At first, all you can do is jump which you learn in the very first stage. Then again, that’s all you need at first. Much like in past Bit Trip games, almost everything you do is done in rhythm to the music playing in the stage, including jumping over enemies or onto platforms. As the game progresses, you’ll learn how to slide, kick, hold a shield in front of you, and bounce off of springboards on the ground. As expected, each of these moves is done in rhythm to the music. The controls feel pretty solid when it comes to executing these moves, which is a huge factor in getting through some of the tougher stages as you’ll constantly be switching between standing, sliding, kicking, and so on at a rapid pace. However, each world isn’t just a simple trek through several levels and fighting a boss. First off, there are some levels that require a certain number of accumulated gold to access, which are denoted as having a stop sign in front of them. 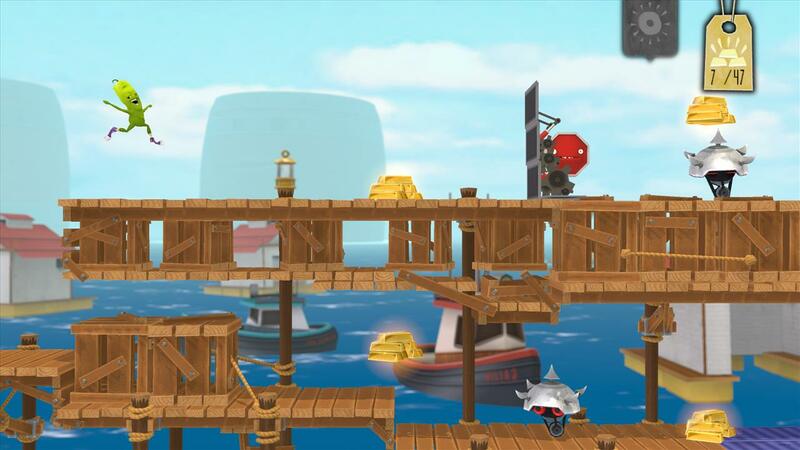 While not required to clear a world, some of these will contain treasure boxes that can be collected to obtain various costumes for the characters. You’ll also notice in some stages that a key is kind of shadowed out, along with a lock that’ll count as an obstacle you have to avoid. In each world is a stage that, once beaten, will allow you to grab the key in a stage, unlock the lock you find, and typically get a treasure box towards the end of that path. Keep in mind though that while there are basically infinite lives, hitting an obstacle will make you lose everything you’ve done since the beginning of the stage or the checkpoint (if you hit it), and that includes any keys or treasures you’ve found. One of my favorite parts of the game is that there are twenty-five retro stages to find and complete. To find these, look for a classic yellow Famicom game cartridge in various stages. Touching one will take you to an 8-bit retro stage that looks like something out of Adventure Island, at least the ones I’ve been through). There are no check points and you have three lives to make it through. However, that’s kind of a moot point because if you run out of lives here, you’ll go back to the map screen where you can hit Y to replay the retro stage without having to obtain it again in the stage where you originally found it. It is worth noting two other things about the retro stages. First, completing a retro stage will allow you to progress to the next stage in the main game, just as if you completed the stage you found the retro stage in (though the main stage will still be marked as not completed). Second, while there is gold to collect in the retro stage, it’s merely for points and will NOT count towards your accumulated gold count for that world. There are a couple things that do kind of bother me. First are the hidden characters. So far I’ve unlocked three other characters as well as costumes for them and Commander Video from the aforementioned treasure chests, but it mainly seems to be just for anesthetics. That’s not completely bad however, as staring at the same character constantly running all the time may get old, so it’s nice to switch it up sometimes…even if it means playing as a man with a fish head or a living dill pickle. Second, and this may just be me, but I can’t go more than several levels without my eyes starting to strain a bit. Now granted I’m playing this using composite cables (and before anyone comments on that, it’s because I occasionally record off my 360 and can only record composite right now) and my eyesight isn’t the greatest as I have to wear contacts, so it may just be me. This is the only game in recent memory that’s done that to me, but it may just be the combination of composite cables, my eyesight, and the fact that things are constantly moving at a fast pace. The only other thing that bothers me a bit is the enemies…well, one anyway. Early on you’ll learn how to kick to attack some enemies. 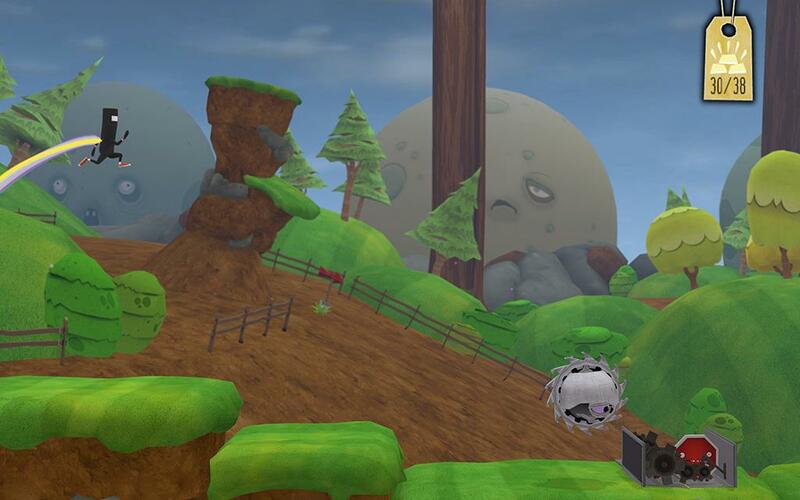 However, when you attack these enemies they’ll break apart and fly off the screen. Sometimes they fly to the left, sometimes the right, but sometimes it’ll be straight towards the screen. While it’s not really bad, it can obscure your vision slightly, and I can’t tell you how many times I’ve smacked into things purely due to this. Most of the time you’re given a decent amount of time to determine the next course of action, but there are still times in which you have to do things a few times over simply to figure out what comes up ahead after kicking an enemy in case it flies at you before it disappears. 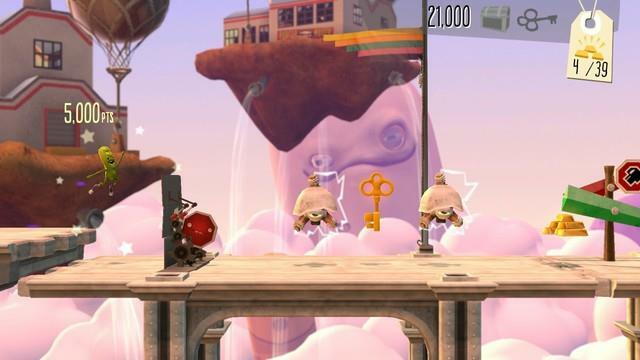 Overall though, Runner 2: Future Legend of Rhythm Alien is a fun and incredibly addicting game. Even though my eyes sometimes need a break from it more than other games I’ve played, I’ve always been into rhythm games like this or similar. The music may start off as just some simple bleeps and bloops, but as you pick up the red crosses and get into a rhythm while collecting gold and dodging enemies, it starts to get quite catchy. Nothing I’d be likely to hum while at work, but then again I’m concentrating more on just surviving the level than memorizing the music. The game also has online leaderboards so you can see where you stack up against your friends and other runners from around the world. Whether you’re a fan of the Bit Trip series or if this is your first go, if you’re into rhythm games I’d recommend picking this one up. Plus, the fact that cut scenes are voiced by Charles Martinet (the voice of Mario)? How can you go wrong? Aside from the minor eye strains (which, again, may just be me), Runner 2: Future Legend of Rhythm Alien is an excellent addition to the Bit Trip series. With solid controls, simple gameplay, and somewhat catchy music, this is a great addition to your gaming library whether you’re a fan of the series or if this is your first outing.